My dad never used to cook. He didn’t need to – my mom was well known for her prowess in the kitchen. But when she died in 1986, cooking became a necessity for my dad – he isn’t one for take-out food. Even though he’s been remarried for 20 years, his culinary skills have grown along with his passion for cooking. 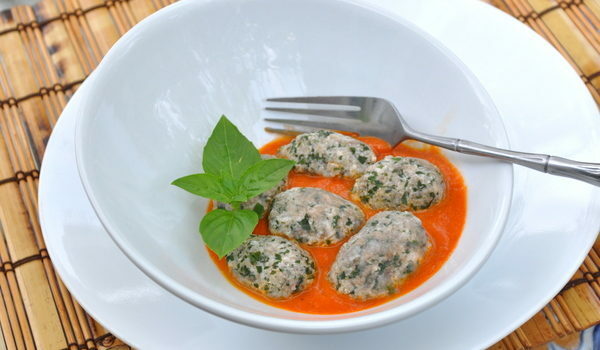 On a recent visit, he prepared these gnocchi with a red pepper sauce and I was enchanted – they’re light enough to practically melt in your mouth and they’re a good way to use up some of the remaining swiss chard in my garden. The red pepper sauce is delicious and a little unexpected too. Don’t like red pepper sauce? They’re also divine with a simple melted butter and sage sauce. They’re easy to make too. All you do is mix a few ingredients in a bowl and shape into ovals. 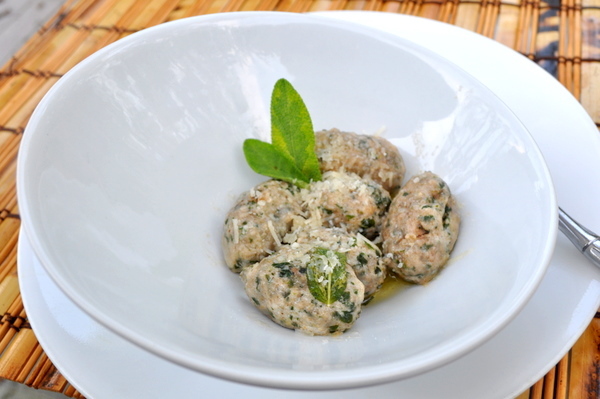 These are sometimes called “gnudi” – the Italian word meaning “naked” since they’re like a ravioli filling without the dough. Warning – I used swiss chard that had red stems and the gnocchi took on a pinkish shade. Upon cooking, they turn a little greyish – not the most attractive food color. 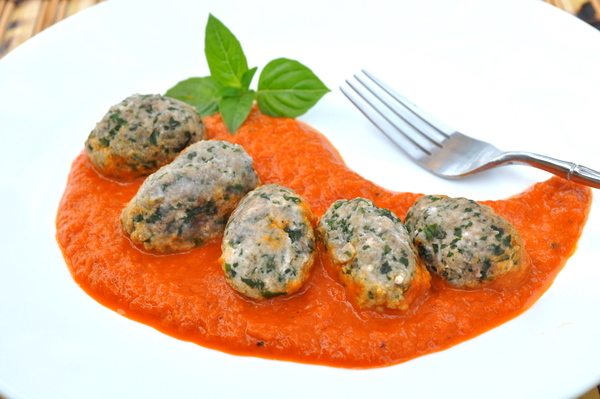 But it doesn’t matter because they’re as light as a cloud and the red pepper sauce adds a beautiful color to the dish. Besides, you can cover it all with a sprinkle with parmesan – something I forgot to do it for the photos. Drain the ricotta overnight to get rid of excess water. Cook the swiss chard leaves in boiling water, drain and let cool. Squeeze out excess water and chop finely. 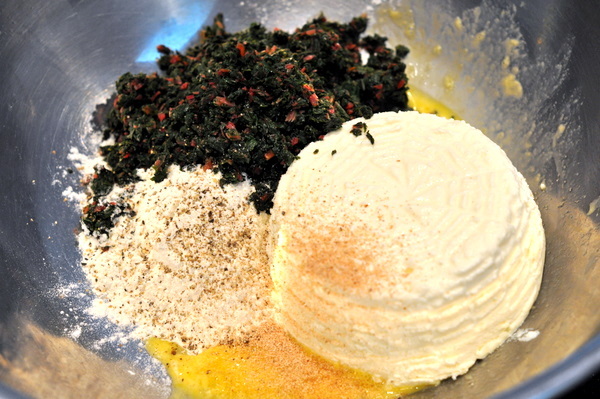 Mix the ricotta, swiss chard and remaining ingredients in a bowl. 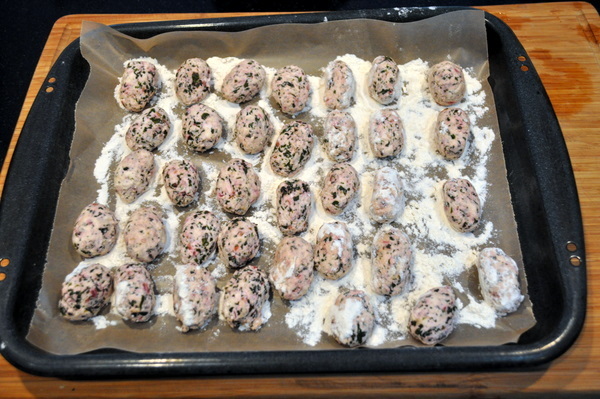 Add more flour if necessary, but the least amount of flour you add, the lighter the gnocchi will be. Dust your hands with flour and roll into oblong shapes. Cook in a pot with ample water, salted until the gnocchi rise to the surface. Drain. Serve with melted butter and sage, sprinkled with parmesan cheese, or with red pepper sauce – recipe below. Cook the shallot and garlic clove in the olive oil. Add the remaining ingredients and simmer for five minutes, then put in a blender and puree until smooth. Pour back into saucepan to heat and serve with the gnocchi.